Personalised Imagination rugs Should You Buy Expensive Flooring Online? Where To Go For An iSense® Carpet? So we can now answer the question “Where to go for an iSense® carpet?” Well you can go to Fludes Carpets of course! The new iSense® carpets are only available in selected independent retailers and we have been chosen as one of them. 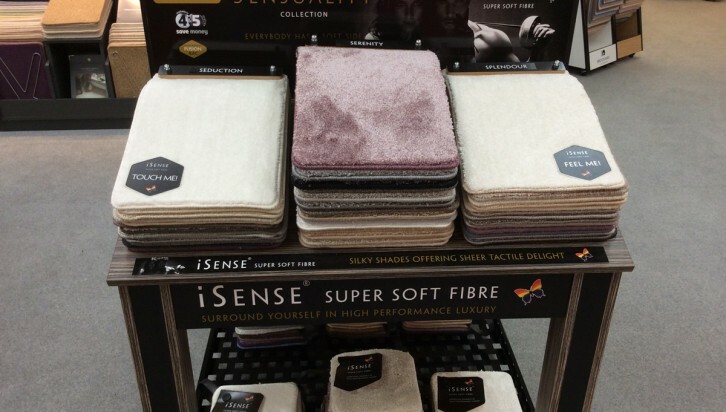 iSense® is a new style of super soft fibre carpet that is just asking to be touched. It feels extremely soft under foot and there is nothing else on the market at the moment to match this. However, even though it is exceptionally soft, it still has the strength for anywhere in the home. A group of 6 ranges make up the choice of sensuous soft carpet that is just asking to be walked on. Prices are from £22 to £36 sq.m. Featuring soft pastel shades that make these carpets ideal to suit any area of your home. Now carpets are a product of colour, style and feel, not just budget alone. In Sussex, you can see the sensuality collection at Fludes carpet stores in Eastbourne, Haywards Heath, Newhaven and St. Leonard’s, near Hastings. In Dorset, call into the Fludes store at Boscombe. Please give us a call if you have any questions. If not please call in to feel this new range of super soft carpets – it will bring a whole new concept to soft carpeting and we are really excited to be a part of the new product.